Traditionally served at parties, celebrations and gatherings. 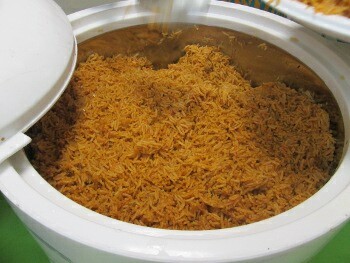 How Jollof Rice Sierra Leone style is made. 1. Prepare meat or chicken stew. 2. Put water, salt tomato puree in a saucepan and bring to boil. 3. Add half to the meat stew and bring to boil again. 4. Clean and wash rice. Add to the boiling liquid. Cover and boil rapidly stirring occasionally as the grains swell. 5. Cook until the rice is soft and the tomato and gravey are evenly distributed throughout. 6. Serve with the rest of the meat or chicken stew and some boiled cabbage or other green vegetable.